What’s up with all the Crayfish? 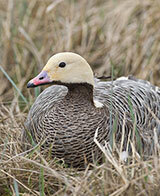 Last fall, for the first time in more than 30 years, Alaskans had the opportunity to hunt an emperor goose. About 500 waterfowl hunters applied for the permit to take a single emperor goose and 128 geese were taken. This year, the opportunity has been extended to non-resident hunters, and 25 nonresident permits were awarded.